This fin is made for the daredevils, for everybody that wants to fast in conditions that are heavy and difficult. Compared to the Select SL7 this fin is easier to ride and gybe, thanks to the lay-up the fin is quite competitive on all courses. Only problem is that this fin is only faster when you can't control the conditions with a SL7. Since I am still not into slalom I can't comment that. 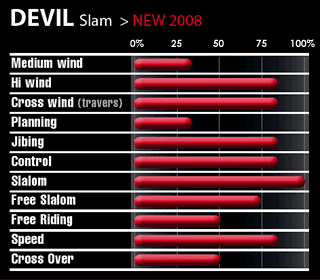 But for simple speedsurfing this fin isn't needed very often. However if your speedspot is on open water, with high sharp chop, the devil could work out. For flat spots this fin fin has to less topspeed, better take a S07 Speed, or SL7.